Picture this: You’re in a client meeting along with a few of your colleagues. The client asks a question, and one of your colleagues starts to answer it — but you can tell he has misheard the question. You observe the client pursing her lips, a slight frown appearing on her face as she realizes she is not getting the information she needs. Your colleague is oblivious and continues talking. You silently think, “Are you kidding me?” and try to build up the courage to speak — but you just can’t find a way in. As a public speaking coach, I’ve heard about this problem time and again. People know they should jump in, yet they’re not sure how to. 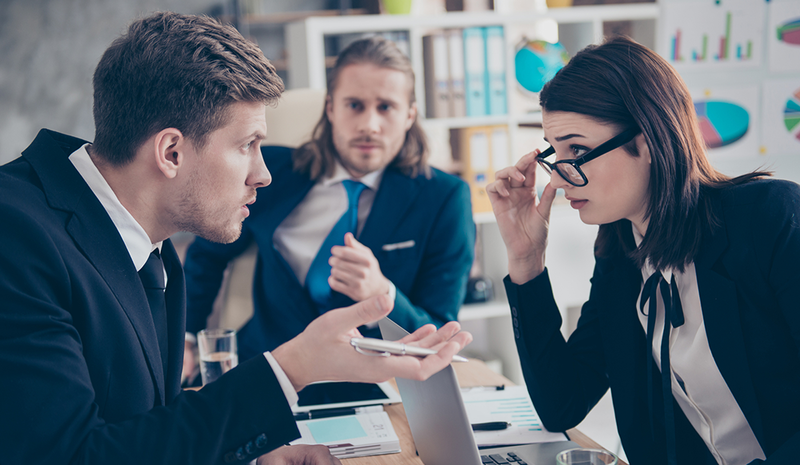 Depending on your office culture, your colleagues may simply love to hear themselves talk, or they may be strategizing to get the boss’s attention. After all, speaking up comes with a variety of benefits for your professional life. In many organizations, your higher-ups will assess your leadership readiness based in part on how well you speak during meetings. Come to the meeting prepared. Ask what I call “The Three Questions” in advance: Who is your audience, what is your goal, and why do you care about this? Armed with that info, you can prepare 2-3 points you want to make or questions you want to ask. That way, you don’t have to think of something brilliant on the spot. Don’t write a script; just bring bullet points. Be fully present and listen to others. It’s easy to get distracted thinking about what you’re going to say. When that happens, however, you miss what is actually being said in the meeting. Stay present and you will hear your chance to jump in. Use deep breathing. Deep breathing will both calm you down and give your voice resonance so that, when you do speak, your voice is strong and confident. Wait for the person speaking to take a breath. They have to breathe sometime, right? When they do, jump in. A strategic filler word like “so” or “actually” can help you wedge yourself into the conversation. Be concise. Keep your interjection brief. Otherwise, you wind up making the same mistake Steve did. Remember to speak with a calm, confident tone. Don’t disparage Steve — though you may be doing so internally — and don’t disparage yourself by second-guessing what you have to say. Be strategic about when you jump in. Remember to speak judiciously. If you constantly interrupt without giving others an opportunity to speak, you monopolize the meeting and reduce your credibility and authority. Just as you want your turn to speak, so do the other people in the room. Many of my clients have used these tips to get a meeting back on track and, in doing so, close an important deal or reach consensus on a key decision. At your next meeting, try out a few of these techniques and see what happens. Use the techniques well, and you can change the trajectories of both the meeting and your own career for the better. Allison Shapira is author of Speak With Impact: How to Command the Room and Influence Others. Allison Shapira is author of Speak With Impact: How to Command the Room and Influence Others. CEO and founder of Global Public Speaking, LLC, Allison was trained as an opera singer and teaches public speaking at the Harvard Kennedy School.